Matthiola is a genus of flowering plants that includes annual, biennial and perennial varieties. They have scented flowers, long narrow gray-green leaves. Flowers range in colors from white to red and purple, pale yellow, lavender and peach. They can be single and double. They grow on thick stems. The most commonly used matthiola in the garden are m. incana (stock) and m. longipetala (evening-scented stock). Stock has been in cultivation since Elizabethan times. 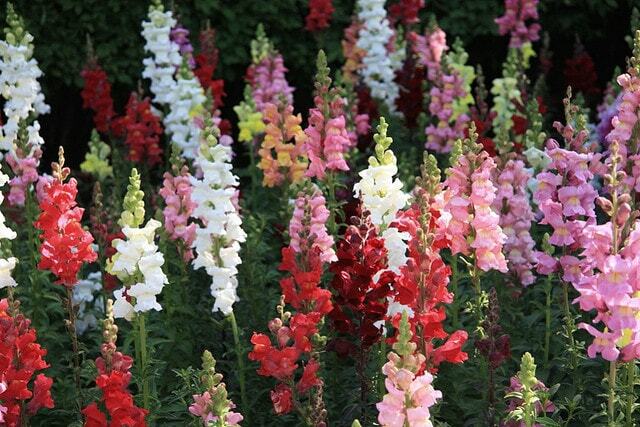 It became a garden favorite during the Victorian era. Matthiola is easily available as starting plants in nurseries during early spring. It prefers cooler weather and bloom better if temperatures stay under 75F. In warm zones, plant them in fall for late winter and early spring bloom. Stocks are easy to grow. They require average to fertile soil that stays moist but well drained. Mulch can be applied to help the soil retain moisture. They need to be fertilized every other week with a balanced liquid fertilizer. They can bloom for a long period if kept deadheaded. Stock looks best when planted in drifts or groups in pots. To grow from seed, either start indoors about six to eight weeks before the last frost date. Plant seed on moist starting medium, uncovered. They germinate in about ten days. if kept at about 65F. Move seedlings to a bright light situation and start hardening off about a week before the last frost date. Plant in their permanent position once danger of frost has passed. Outdoors, direct sow in a prepared, moist bed in spring, once danger of frost has passed for bloom the next season. If sown outdoors, under 40F, the color of the seedling indicates whether or not they will be bear double blooms. Light yellowish seedlings bear double flowers, dark green ones, single. They are not disease prone if kept in well drained soil. If aphids become a problem, blast with a spray of water from the hose.